Get over 35 years of North Dallas and Plano TX Expertise on Your Side! Buying a home involves many difficult decisions. Make sure your REALTORS® are experts. Your home is probably one of the biggest purchases your family will make, and buying a home involves many decisions that go beyond simply choosing one you like, or even love. 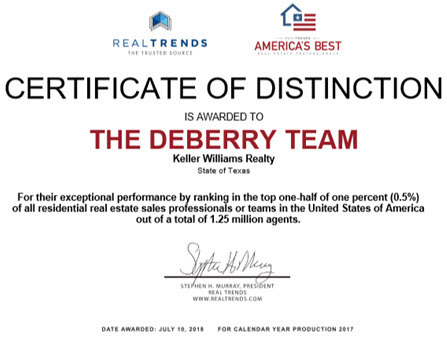 Because it is such a significant investment, when it comes to buying real estate in the North Dallas and Plano TX area, know that you can have The DeBerry Team, highly experienced REALTORS®, represent you. We live to help buyers and sellers like you find their ideal home. You can take comfort in having a team on your side who truly knows what they are doing! You will have access to ALL houses for sale in the North Dallas and Plano TX areas. The DeBerry Team will also be on the lookout to show you listings that are not yet on the MLS. Our knowledge of REALTORS® in the North Dallas and Plano TX area will ensure that you get access to all houses for sale in North Dallas and Plano TX . Our thorough knowledge of the North Dallas and Plano TX area can be invaluable to you, not only in terms of real estate, but also schools, neighborhoods, the local economy, and many more areas of expertise that may be vitally important to your home purchase. Every local real estate market has its unique trends and opportunities. North Dallas and Plano TX areas are no different. To use a golf metaphor, it's our job to steer you into property opportunities that keep you on the fairways and out of the sand traps! What is the true market value of the home you are interested in? Is it priced too high? Is it a bargain that you should jump on? We help home buyers make decisions like this every day, and we will make sure that YOU get the best value for your hard earned money. Negotiating with sellers can be a stressful process. You may have to compete with rival offers. How much should you bid? By having an experienced REALTOR® on your side, The DeBerry Team will help you negotiate every step of the way so that the final price and contract have the most favorable terms and conditions possible that meet your needs. Before buying, you should know absolutely everything about any real estate in the North Dallas and Plano TX area that you are interested in purchasing. Together, we will view every home that you are interested in. Prior to closing, we will make sure you are fully aware of any and all inspections available to you. Have confidence when signing documents. Contracts are full of complicated terms and clauses that can greatly affect your future life in your new home. Let The DeBerry Team give you the advantage of over 35 years of real estate knowledge and experience. "Best Service I Ever Received!" Ask us any question you have about homes for sale in North Dallas and Plano TX areas. It's our job to help you! There is no obligation, and we guarantee a swift response. As your buyer's representative, we can make the process of house hunting much safer, calmer, and more enjoyable than if you embark on this adventure alone. We can help you determine your budget, guide you around the local neighborhoods, help you with financing, and prioritize the essential features that you need in your next, or first, home. We’ll save you valuable time by finding the properties that best suit your requirements, and we will show you only the most promising ones. We promise to make your home search as efficient and profitable an investment as possible. Once you've found a place that catches your eye, we’ll look at comparable properties in the area to help determine a purchase offer. We will then negotiate with the seller on your behalf to make sure you get the most favorable terms. We will absolutely look after your best interests, and we’ll do so, of course, at no cost to you, the buyer.